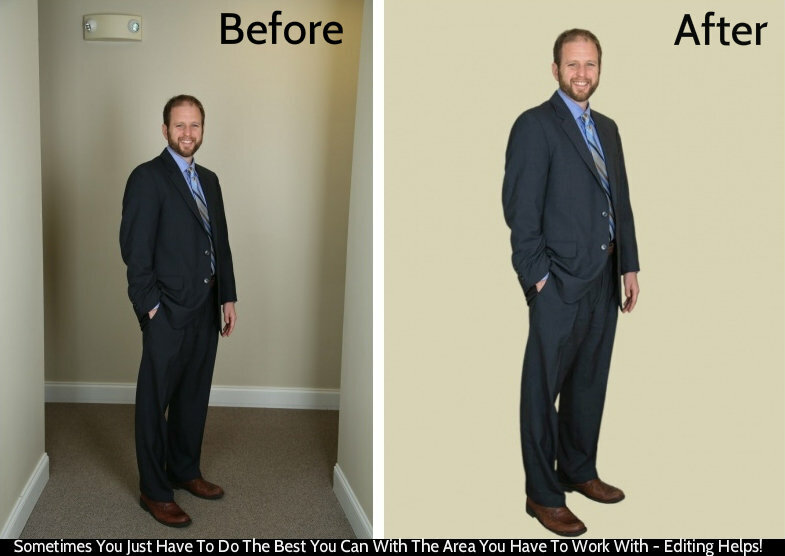 The attorney above needed a full length photo, but there wasn't enough space in the office to set up a typical 9ft. wide studio back drop with softboxes and studio strobes. So I got creative knowing that we could fix it all in post. I used an Einstein strobe with a strip box for lighting. I have found that strip boxes work well for tight situations. Rather than crop the before image so tight that there would not be room for the cutout, I left plenty of room for Brenda to work with. As you can see by the after image on the right, Brenda was able to successfully cutout the subject and create a nice full length photo. If your personal editing skills are not where you want to be and you are still learning, you can always try a service like Retouch Up (not an affiliate link) that should be able to help you with some of the more challenging issues as well as basic editing. In my case, I love having my wife, Brenda, internally to do my editing as well as Lindsay when needed.